I had a hankering for pasta on Sunday night so I decided to make a quick marinara sauce. I found some mushrooms in the fridge and grabbed a few things from the pantry then whipped up this sauce. Quick. Simple. Delicious. My kind of recipe! My kids absolutely loved this sauce and so did my husband and I. 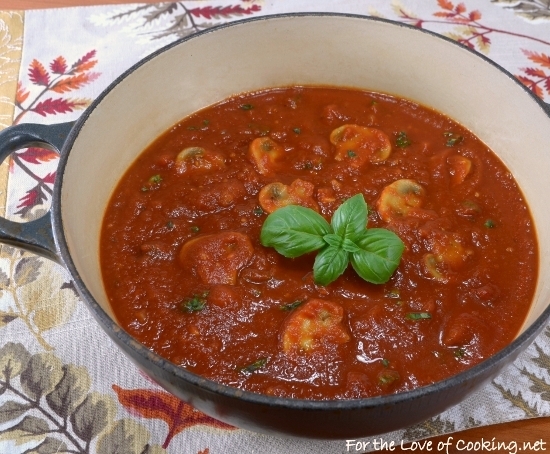 It was delicious on spaghetti but would also be great with tortellini, ravioli, or lasagna too. Heat the olive oil in a small Dutch oven over medium heat. Add the mushroom, onion, oregano, and crushed red pepper flakes. Cook, stirring often, for 5-7 minutes, or until tender. Add the minced garlic and cook, stirring constantly, for 1 minute then add the tomato sauce. Using an immersion blender (or blender), blend the canned whole tomatoes. Pour them into the Dutch oven and stir until well combined. Cover with a lid and let simmer for 30 minutes or up to 2 hours. Taste and season with sea salt, freshly cracked pepper, and a touch of sugar (if desired). Add the chopped basil and ladle over prepared pasta. Enjoy. I use ground beef, onions, tomato paste and diced tomatoes, then add water to get it to the right consistency. A fast and easy red sauce is a beautiful thing, isn’t it? Our daughter and husband are vegan. They’ll be in town this weekend. Perfect! Year’s before they became vegan she gave me Pam’s site, I’ve been a believer since then. Wish I had Pam’s knack for “throwing together what’s on hand”, instead I took to you. 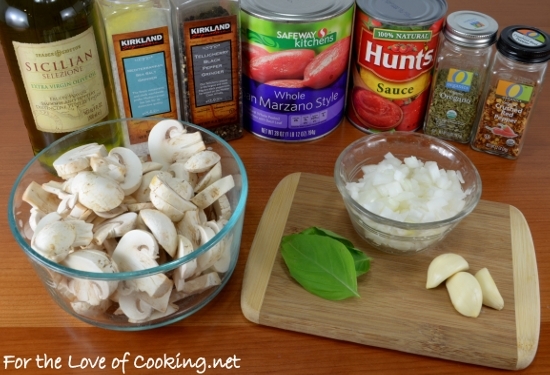 I love the idea of adding mushrooms to this classic pasta sauce. It looks so yum! Hard to beat an easy throw together recipe that pleases everyone. 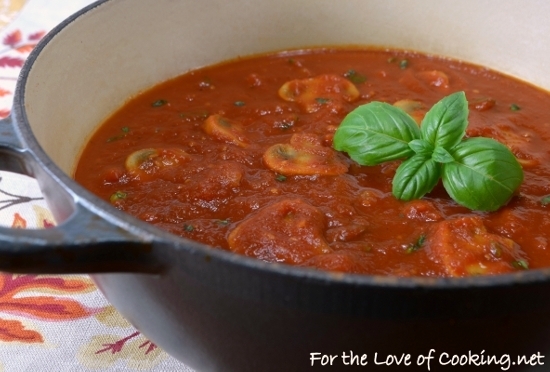 This si a very delicious looking variation on marinara sauce and would go so well with a lot of dishes. Brett would love this, Trevor wouldn’t. Guess which one likes mushrooms, ha ha.